THE NEIGHBORHOOD stars Cedric the Entertainer (pictured, left) in a comedy about what happens when Dave Johnson (Max Greenfield, not pictured), the friendliest guy in the Midwest, moves his family to a neighborhood in Los Angeles where not everyone looks like him or appreciates his extreme neighborliness. 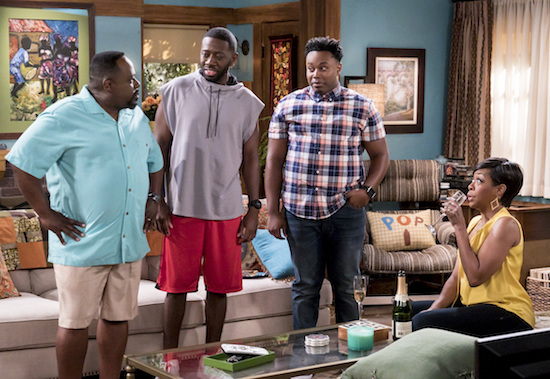 Cedric the Entertainer plays the Johnsons' opinionated next-door neighbor, Calvin Butler, who is wary of the newcomers, and certain that the Johnsons will disrupt the culture on the block. Calvin's family includes his sons, Malcolm (Sheaun McKinney, second from left) and Marty (Marcel Spears, second from right), and his wife, Tina (Tichina Arnold, right). THE NEIGHBORHOOD will premiere this fall on Mondays (8:00-8:30 PM, ET/PT) on the CBS Television Network. Photo: Monty Brinton/CBS ÃÂ©2018 CBS Broadcasting, Inc. All Rights Reserved. THE NEIGHBORHOOD premieres tonight at 8/7c on CBS.